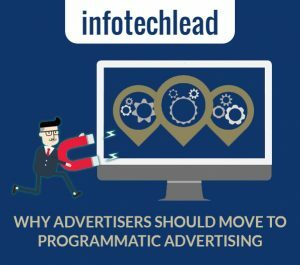 The statics for the Programmatic advertising have been a pointing towards the upward motion what with it promising to on 50% of the digital ad space by next year globally. The world has adopted to the progressive nature of life be it technological or otherwise, no one is interested in taking a step back. Traditional methods for business must be valued but must not be clinged on to. Programmatic Advertising has been showing promising results to business that have opted for it. The efficiency and cost effectiveness that it provides to the business must alone be the reason enough for advertising their business through programmatic method. With daily new improvements and upgrades in the programmatic method it is certain the future for all the channels of online advertising. IntechLead.com, launched by Kizhakedath Media Service Pvt. Ltd. Covers segments such as Networking, Cloud, Data Center, Mobility, BPO, IT services, Social, Big Data, Analytic, Hardware, Software, Security, Enterprise Applications, etc. InfotechLead.com focuses on CIO interview, analysis, news, whitepaper, case studies, contributed articles, etc. Vertoz is the complete advertising and monetization suite. Programmatic advertising comprises of automated media buying, placement, and optimization of digital advertising, where both supply and demand partners are free from human intervention. Vertoz is among the top programmatic company that offers engaging and innovative advertising and monetizing solutions. Amongst all the top ad tech companies, we empower a global roster of top advertisers and publishers- all under one roof. We offer one-stop-shop for you! We only talk about programmatic advertising technology and we cater out finest ad buying system.